Az intézetben született vagy születő félben lévő kutatási eredmények, szakmapolitikai vélemények, valamint az aktuális gaz­dasági, közéleti és társa­dalom­politikai kérdések vitafóruma. és emailcímük kíséretében juttassák el szerkesztőnkhöz. A beküldött cikkek és hozzászólások előzetes moderációt követően jelennek meg honlapunkon. ÚJABB BEJEGYZÉSEINKET ITT ÉRHETIK EL! Since the summer of 2016, the global economy has been in a period of moderate expansion, yet inflation has yet to pick up in the advanced economies. The question that inflation-targeting central banks must confront is straightforward: why? 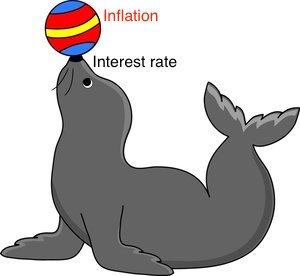 This paper combines the talk by that title with a much revised "Do Higher Interest Rates Raise or Lower Inflation," which no longer exists as a separate paper. 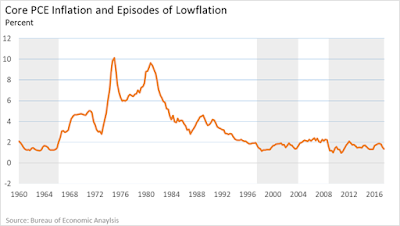 The fact that inflation is quiet and stable at zero rates cleanly invalidates the standard old-Keynesian model, which predicts a deflation spiral, and almost as cleanly invalidates new-Keynesian sunspots. New Keynesian price stickiness plus fiscal theory selection works well. Stable inflation suggests a higher rate will raise inflation. That conclusion is very hard to escape, even temporarily. One fiscal theory mechanism with long term debt does it. Even that does not rescue traditional views of monetary policy. It would not be possible or wise to exploit even that negative sign. Today the European Central Bank publishes the proceedings of its 2015 Sintra Forum on Central Banking (ECB 2015). In this column the organisers highlight some of the main points from the discussions, including the candid debate between Forum participants that favour a faster pace of structural reforms and the ones that would like to see a more aggressive monetary policy response to real economy developments. How Much Do Inflation Expectations Matter for Inflation Dynamics? Having dropped to 5.1%, the unemployment rate has reached the longer-run employment goal of the Federal Reserve’s Open Market Committee (FOMC). So, starting to raise interest rates would seem to be in the cards. And, many observers expect policymakers to act soon, possibly very soon. Before the Economic Policy Conference hosted by the National Association of Business Economists, Alice Rivlin discusses the future of monetary and fiscal policy under the premise that inflation may not be a threat that central bankers need to protect us from.